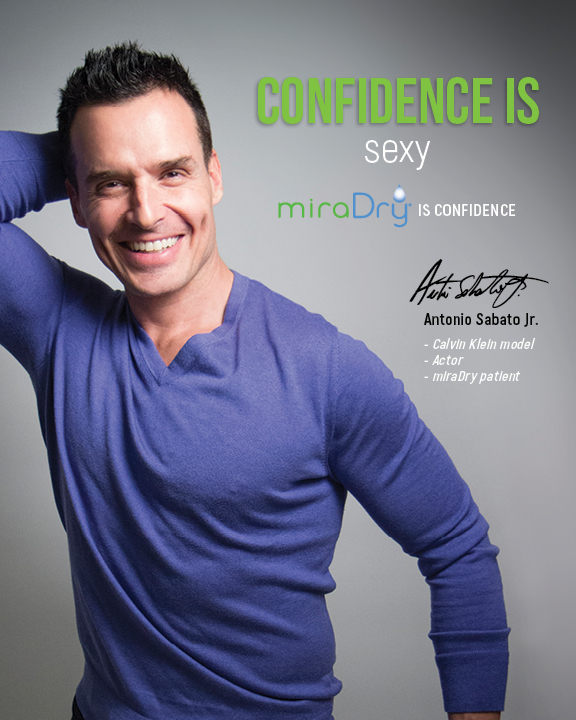 MiraDry® is a completely new type of treatment for excessive axillary hyperhidrosis, (excessive underarm sweating). 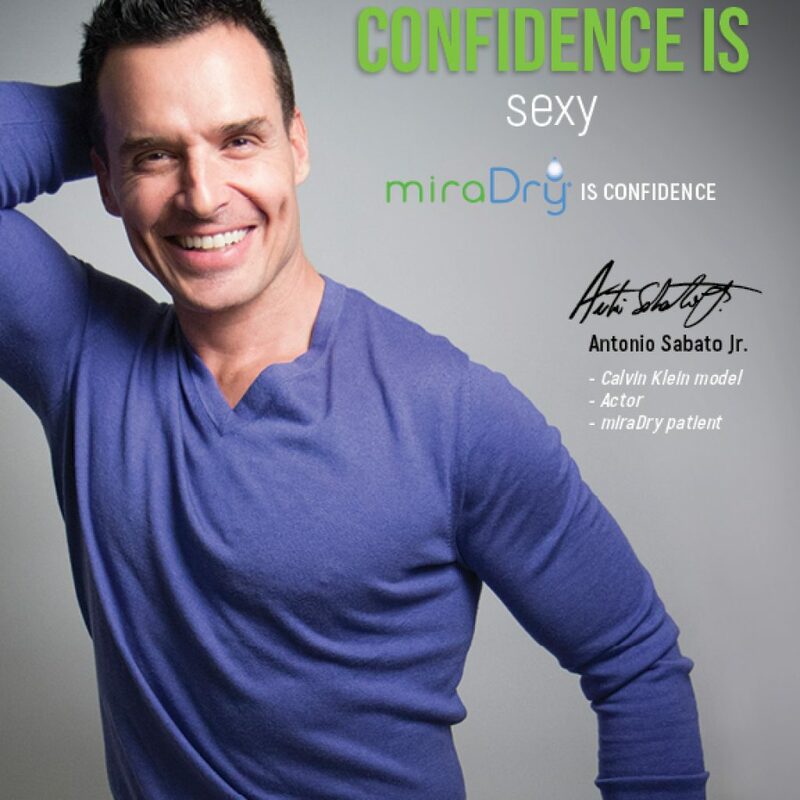 MiraDry® received US FDA approval in January 2011, and since than thousands of people around the world have undergone treatment for excessive hyperhidrosis with great success. 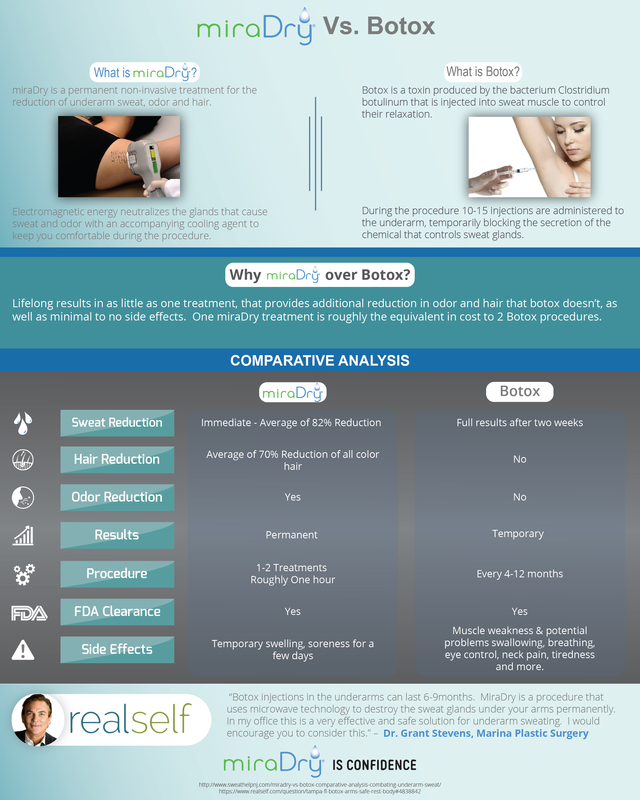 Previously Botox® treatment of excessive axillary hyperhidrosis was the preferred treatment option compared to ETS, dermabrasion, liposuction or other mechanical therapies, but MiraDry® has proven to be far superior because, although results may vary, results are long-lasting, with almost no prolonged side effects, and rarely any compensatory sweating, scarring or disfigurement. 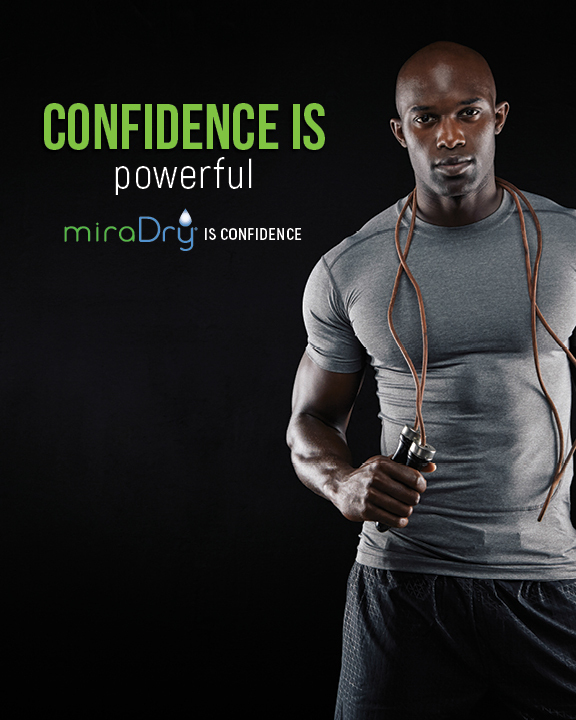 MiraDry® uses a non-invasive handheld device to deliver precisely controlled electromagnetic energy beneath the underarm skin to the specific location of sweat glands, resulting in thermolysis (decomposition by heat) of the sweat glands. While the sweat glands are being eliminated through electromagnetic technology, the top layers of the skin are simultaneously cooled and protected. Sweat glands do not grow back after treatment so the effect can be seen almost immediately and results are typically lasting. 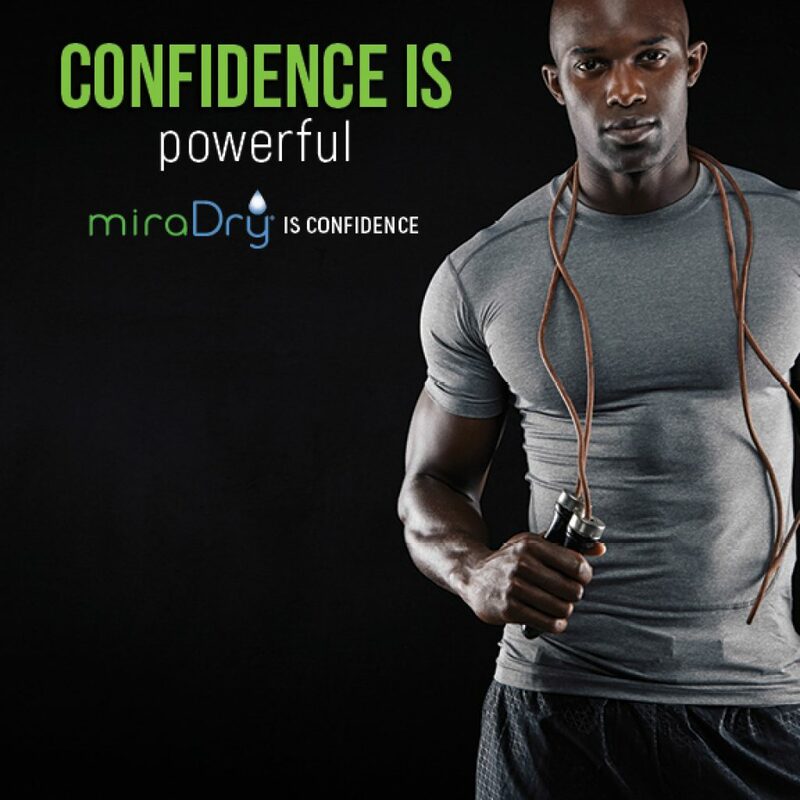 While Miramar Labs is the first and only company to gain official FDA clearance to use electromagnetic energy to treat excessive sweating through eliminating the axillary sweat glands, the technology has been used safely in other areas of medicine for years. Established medical uses of electromagnetic energy include applications for cardiology, cosmetics, general surgery, urology, and oncology. Outpatient physician visits for MiraDry® treatment typically take one hour during which a physician administers local anesthesia (usually lidocaine injections) and then uses the MiraDry® handheld device to deliver electromagnetic energy non-invasively to the underarms. The MiraDry® device cools the outer layer of the skin and patients usually experience little to no discomfort during the procedure. There is minimal to no downtime afterwards. A mild over-the-counter pain medication and ice packs are generally recommended for a few days. Most patients are able to return to normal activities or work right after the procedure, and can typically resume exercise within several days. The safety data from the three clinical studies of MiraDry® has been reported as very good. Common side effects include mild to moderate temporary swelling and discomfort in the treatment area lasting about one week. Mild numbness or altered sensation of the skin in the underarm area can last several months. While sweating is an essential body function for temperature-control, the underarms house less than 2% of the body’s sweat glands. The elimination of these sweat glands should have little no effect on body thermoregulation and compensatory sweating (sweating on other body parts) has not been shown to be a concern. Miramar labs have established treatment centers for excessive axillary hyperhidrosis throughout the world. The Center for Hyperhidrosis at Columbia University, was one of the first to offer this treatment for excessive sweating in the New York Metropolitan area. Patient satisfaction is very high, witnessed by the overwhelming positive patient testimonials. 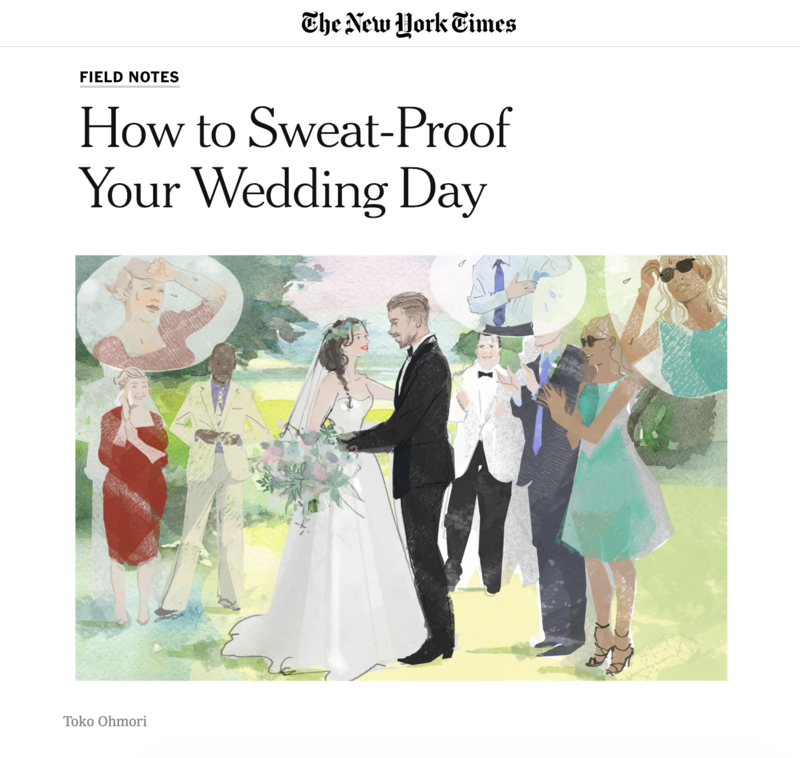 The New York Times advocates MiraDry® for a stress-free and sweat-free wedding day! Read all about it here.